We have attached India Sudar Monthly Account Sheet for the month of July and August 2016. Our onsite school -Municipal Middle school,West Colony, B.Komarapalayam, Namakkal Dt celebrated annual day on 17th Feb 2017. Indiasudar printed certificates for sports events, rank holders and 100% attendance. We provided prizes for Best Outgoing students and rank holders. On behalf of Indiasudar I participated and encouraged the students. Headmistress explained about Indiasudar and our activities to improve the quality of education. Approx. 600 Nos were present (parents and students). After the event got over (By 10.30 pm), one parent approached me and appreciated INDIASUDAR and conveyed THANKS on behalf of the entire parents community. Please find the attached project reports for more detail. 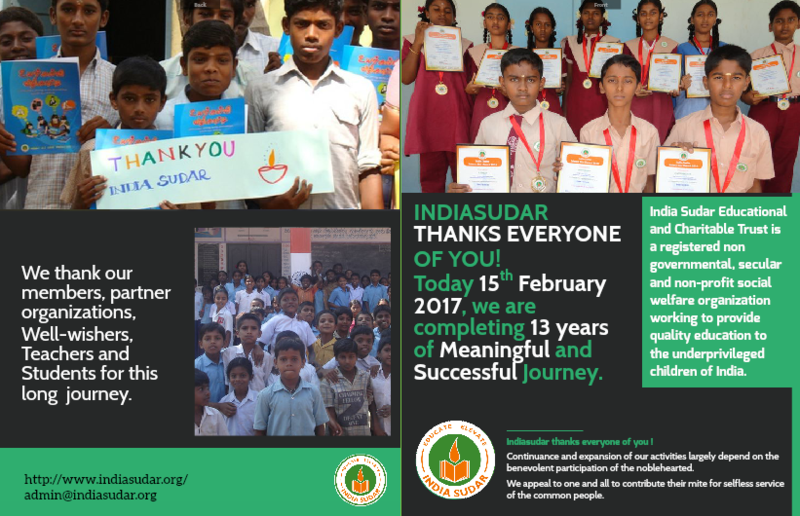 13 years completed- Happy Birthday to Indiasudar ! Today 15th February 2017, we are completing 13 years of Meaningful Journey. Indiasudar thanks everyone of you for your contribution ! Special Thanks to our member Mr Jayakumar for designing this thanks giving image. Indiasudar introduces BEST OUTGOING STUDENT AWARD (Male and Female) for each onsite by collecting nominations from school teachers. Punctuality , Respect, Cleanliness, Simplicity, Good words , Attendance, Honesty, Social care, Long term plan and objective of the student, GK, Library usage, Leadership quality, Academic marks, sports, arts and literature,guidance and contribution of the student to his/her family. Please find the attached file (in Tamil). Award comprises of certificate , framed certificate , medal and one school bag (Approx. Rs. 1500 per award). If anyone is interested to sponsor for best outgoing student award to motivate students studying in Govt schools, plz come forward. One of our onsite school -Municipal Middle School, Komarapalayam Namakkal Dt is having annual day celebrations on 17th March 2017. 1. Top Academic performers – 1st and 2nd in each class. 100 x 12 = 1200 Rs. If anyone of you interested, plz come forward and encourage the students. Success Story and Academic assessment of Karthik Prasath M B-BE(CSE)-4th Year. We very much glad to share the happy moment that student Karthik Prasath got placed through campus recruitment in Sirius Computer solutions, Chennai, he will be joining very soon in his job. It’s truly inspirational and wonderful to see people like you to make difference in the lives of people in need. Family Background Having one sister studying 12th in Govt school. Family is taken care by her mother. She is doing stitching work and earn Rs.4000 p.m(approx.) They are staying in rented house. Thank you once again for your endless support. This is to inform you that the India sudar has provided educational stationary i.e Nanneri Kalvi (Moral Education book) for the students of Govt Hr Sec School, Velliankadu, Karamadai, Coimbatore (DT) by keeping the view of career guidance program for rural schools. For further details, please find the attached project report.